Manly has won its first game since April, beating St George Illawarra 36-6 at Brookvale Oval. 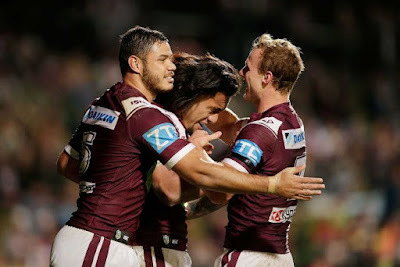 Since beating Newcastle 26-10 in round eight, the Sea Eagles have gone on a seven-game losing streak, but they snapped it against an uninspiring Dragons side on Monday night. Back rower Nathan Green opened the scoring in the 23rd minute, kicking off a run that included doubles for Dylan Walker and Jorge Taufua. Walker, who was dropped from the Blues' side for State Of Origin III, exacted some revenge on the man who took his centre spot when he picked off a Josh Dugan pass and went 90 metres in the 38th minute. Back rower Jamie Buhrer also scored a 90-metre try, charging through some weak defence and just barely making the distance. Dugan scored a consolation try in the 77th minute, before Daly Cherry-Evans found Brayden Wiliame with a brilliant cut-out pass in the second-last minute of the game. Wiliame may find himself on the match review committee's for a shoulder charge on Dugan.